Andrea Lattanzio has a talent for building awesome LEGO vehicles, and his latest build is almost too hot to handle. 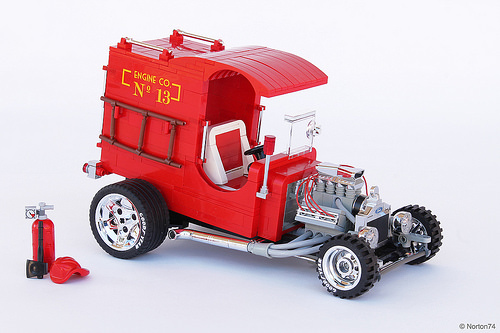 The original Fire Truck is a’67 Chuck Miller’s Ford C-cab and was designed as a custom car to win prizes at car shows. Andrea’s LEGO version manages to be just as cool hot as the original. Andrea included chromed parts to give the vehicle that special shiny hot rod feel, but his fire truck is made purely from genuine LEGO parts. I particularly love the shiny V-8 engine and the pipes leading to the exhaust — as a chick, it’s not often I can say an engine is a thing of beauty! The ladder is created with 3mm hose and reddish brown minifig hands to ensure the correct dimensions — great attention to detail, Andrea. Also, the build has a nice mix of Fabuland accessories, such as the axe and fire helmet used to match the scale of the vehicle. We’ve blogged Andrea previously on TBB, and it’s definitely worth taking a look at his Green T – 1923 Ford Model T, 1932 Ford roadster and, my own personal favourite, his VW Transporter getting an overhaul.